Charged with developing recommendations to accelerate the adoption of cloud technologies in the U.S. Government and commercial space, the Commission on the Leadership Opportunity in U.S. Deployment of the Cloud (CLOUD2) has completed its 3-month study - identifying potential barriers, recommending actionable solutions, and outlining the keys to successfully transitioning to the Cloud. 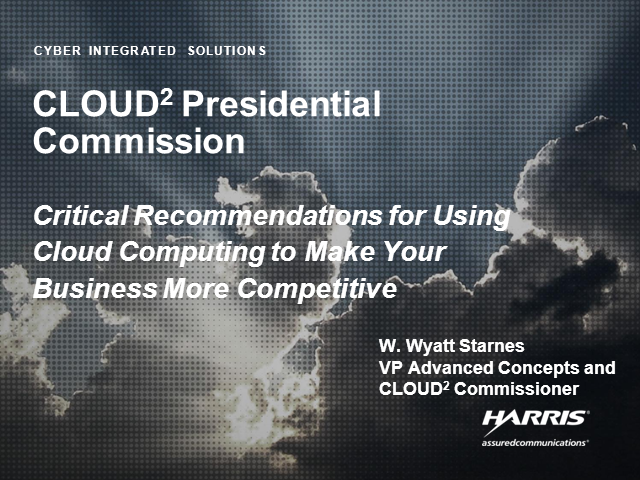 Please join us on Wednesday November 9th with Wyatt Starnes, CLOUD2 Commissioner and Vice President Advanced Concepts at Harris Corporation, at Jim Ganthier, Vice President ISS Marketing at HP as they present CLOUD2 Presidential Commission - Critical Recommendations for Using Cloud Computing to Make Your Business More Competitive. We will review the Commission's findings and discuss how the Harris Trusted Enterprise Cloud, built on HP Converged Infrastructure, builds upon its recommendations. Plus, all attendees will receive our CLOUD2 Checklist.